Recently I have come across a number of Mac schools and businesses running Munki, an open source software distribution tool. I have only studied it for a couple weeks but I can already see why so many Mac sites are using it. This post covers the concept of Munki, my best practices and a list of common commands. To put it simply, a Munki server maintains a repository of Mac software. Users running the Munki client application (a.k.a. Managed Software Update) are notified of new software and are then prompted to install it. Munki can deploy newer versions of currently installed applications (e.g. Google Chrome), Apple software updates (e.g. OS X 10.9.3 Combo) or even custom in-house packages (e.g. ConfigurePrinters.pkg). Munki can also detect if an application has been deleted and will reinstall it. pkgs: This contains all available software, generally as dmg, iso or pkg files. pkgsinfo: This contains a plist file for each software in the pkgs folder. It’s common to edit these plist files to add software to different catalogues, set software dependencies or edit the minimum OS requirements. The Munki server reads all the plists in pkgsinfo and compiles catalogues from the data. Clients do not access this directory. catalogs: This is another directory of plists. My Munki server has two catalogues: ‘development’ and ‘production.’ Catalogues are useful for sandboxing new versions of software until they are deemed ready for widespread deployment. Munki automatically generates a catalogue named ‘all’. This catalogue should not be included in any manifest. manifests: This directory contains more plist files, controlling which software is deployed to which clients as each client is set to download a specific manifest (e.g testing, staff_laptop, etc.). A manifest plist lists software (without versions) to install and/or remove. You can also add the optional_items key in a manifest plist and specify a list of optional software choices. This provides a self-service interface, allowing users to choose from the list of optional software. To make maintaining the Munki repository more intuitive, I have taken a different approach to naming my catalogues and manifests that differs from norm found on the Munki wiki. I have chosen not to have a ‘testing’ catalogue, only ‘development’ and ‘production’ catalogues. I do however have a manifest called ‘testing’ that accesses the ‘development’ catalogue. Munki imports new .dmg files with the same filename. To keep the repository tidy, I recommend renaming files before importing. The filename should be in lowercase with no spaces, followed by a dash and the softwares version number (e.g. googlechrome-2.1.4.dmg). In my previous workplace, every Mac ran a SOE (Standard Operating Environment) suite of software. Depending on the location (e.g. Art, Music, etc.) and user type (e.g. staff or student), specific extra software (e.g. Photoshop, Sibelius, etc.) was installed. On top of that there were faculty that required access to software normally only provided to Art or Music computer labs. Since Munki clients can only check a single manifest, I dealt with this limitation by creating a structure of manifests included in other manifests. It seems confusing at first, but once the infrastructure is set up, assigning new software to all relevant clients is simple. The green bubbles are manifests that clients check, we normally do not add any software directly to these. Yellow are purely for merging manifests, again nothing should be added to these. Blue are core attributes (e.g. 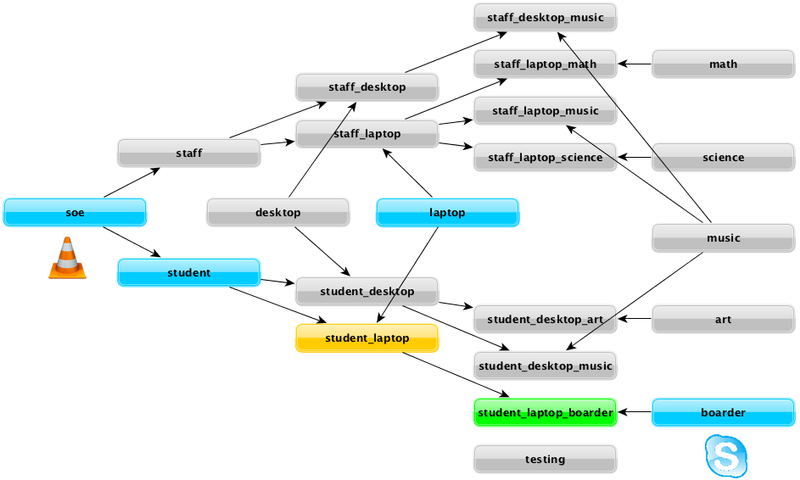 laptop, staff, science, etc) software is assigned to these. The boarder’s MacBooks are configured to check the ‘student_laptop_boarder’ manifest and therefore are notified of any changes made to ‘soe,’ ‘student,’ ‘laptop’ and ‘boarder’ manifests. Since Skype was added to the ‘boarder’ manifest, Managed Software Update lists Skype as well as VLC media player from the ‘soe’ manifest as available software. Please note: Manifests directly accessed by clients require a catalogue (e.g. ‘production’) to be specified, however, included manifests that are not directly accessed by clients do not require a catalogue to be set. In this example I have two versions of Skype, 6.15 and 6.17 in my repository. Version 6.15 has already been tested and added to the ‘production’ catalogue, however, the newer version 6.17 still needs to be tested and was added to the ‘development’ catalogue on import. After thoroughly testing Skype version 6.17, I would simply edit the associated Skype-6.17.plist file in pkgsinfo, replacing 'development' with ‘production’ in the 'catalogs' section. The new version of Skype is now part of the ‘production’ catalogue and made available to clients. sudo defaults write /Library/Preferences/ManagedInstalls SoftwareRepoURL "http://swupate.local/munki_repo"
sudo defaults write /Library/Preferences/ManagedInstalls ClientIdentifier "student_laptop_boarder"